We are hoping that Wesham Post Office will be saved from the threat of closure! The desision will be published on 22nd January 2008, followed by a 6 week public consultation period. Members and supporters of the Medlar with Wesham Parish Plan committee will soon be informed of the next meeting in order to progress the completion of the Parish Plan Document. The date for the next phase of the process is set for (7.30pm) 23rd January 2008 at Wesham Community Centre. The Committee Secretary will be notifying members and supporters of the Agenda in due course. 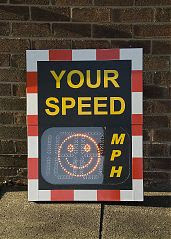 Wesham Town Council have, in principle, agreed to purchase a Speed Indicator Device (SPID) for Wesham. (Subject to funds being available). At a recent Wesham Town Council meeting, Cllrs Theresa McGardle and Alan Clayton summarised their recent successful training session at Lancashire Police Headquarters giving them full authority to install and maintain the unit on behalf of the Town Council. Currently 2 sites are available : 1) Weeton Road and 2) Fleetwood Road. Consideration may be given to additional sites in the future subject to Lancashire County Council approval. The authority for Town and Parish Councils has been the subject of much discussion by LCC, Lancs Police and the Fire Authority due to Health and Safety implications. The joint group have recently come up with a sensible and practical solution to allow for the utilisation of the SPID by Parish and Town Councils. Wesham Community Pride Trust have arranged for the purchase and installation of the new clock which has been installed at the old fire station. The official 'switch on' was done by the Mayor and Mayoress of Wesham, Cllr David Ogden and Mrs Evelyn Ogden on Monday 10th December. 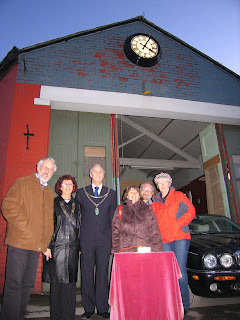 WCPT are grateful to Mr Peter Weare (Trade Suppliers Car Sales) for the permission of using the old fire station premises.